Sarva means “all”, dvara means “door”, and baddha means “bound.” All the doors or gates where prana can escape are closed. Sit comfortably and apply shanmukhi mudra (cover the ears with the thumbs, eyes with the index fingers, nose with the middle fingers, upper lip with ring fingers and lower lip with the baby fingers.) Keep the finger pressure light the nostrils to allow for breathing. Breathe in slowly through both nostrils, visualizing the prana flowing all the way down to the muladhara chakra and filling the space up to the throat chakra. During the “pause” at the top of the inhalation, concentrate on the ajna chakra. Then begin a slow, controlled exhalation through both nostrils, releasing the power of the senses with the breath. Repeat several times, if comfortable. A more advanced version of this pranayama is to have intentional breath retentions while visualising the ajna chakra. This pranayama leads one to pratyahara (withdrawal of the senses). As we withdraw the senses from the outward-moving consciousness, we awaken the inward-moving consciousness and the divine light of the third eye. Awakening the third eye gives us knowledge of the Self. 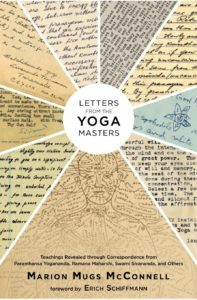 This is a sneak peak into Mug’s book “Letters from the Yoga Masters,” due to be released June 7th! Join Mugs McConnell for a weekend or 7 days, immersing yourself into classical yoga practices and techniques. The 7-day Retreat is Oct 15th to 22nd at Sanctum Retreat, Caroline AB.